Those of you who follow me on twitter will know that I had a bit of Balmain-induced episode today when the photos from Paris Fashion Week rolled in. Honestly though. I couldn’t contain it. Just plain awe. When Alicia Keys wore that dress to the Brits that time, it became one of my aims in life to have a piece of Balmain in my wardrobe. Preferably in the DRESS form, thanks. In fact, while we’re at it, if I was ever to marry (I know, I know – it ain’t happening, but let’s just think upon this ludicrous notion for but a moment) – that dress down there in the middle? Yeah, that’d do just nicely, thanks. So, anyway, where was I? 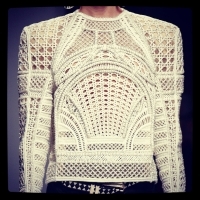 Oh yeah, just a bit of Balmain in my wardrobe. It’s the sort of aim that’s not too far out-of-reach as to be unattainable, but far enough out-of-reach as to still be a dream. One day, kids, one day. I promise you that. → and it stoned me to my soul/ stoned me just like goin’ home/ and it stoned me. ← i need no words to define myself.